Home / Blog / News / Follow the White Rabbit into Zenescope’s Wonderland of Adult Coloring and Acquire Incredible Winnings! Join in Zenescope’s wondrous coloring contest for the upcoming Alice in Wonderland Adult Coloring Book! Submit to the following categories: (1) Pencil, (2) Marker, or (3) Digital. Email your category choice and PDF entry to coloringcontest@zenescope.com by end-of-day June 10th. Each category’s (pencil, marker, and digital) 1st Prize Winner will receiveWonderland’s “The Last Supper” 20″ x 30″ Canvas Art Print (Cover A from Alice in Wonderland #6 by artist Anthony Spay) and three Wonderland 11″ x 17″ Art Prints, featured below. Each category’s (pencil, marker, and digital) 2nd Prize Winner will receive a Wonderland Omnibus as well as the three Wonderland 11″ x 17″ Art Prints. Also, be sure to pre-order your copy of the Alice in Wonderland Adult Coloring Book now; only available at Amazon http://amzn.to/1XJ3Eut and Books-A-Million http://bit.ly/26vhdnd! 4 of 5,861 SDCC 2018: Just announced! The Beatles Yellow Submarine Limited Edition Box Set! 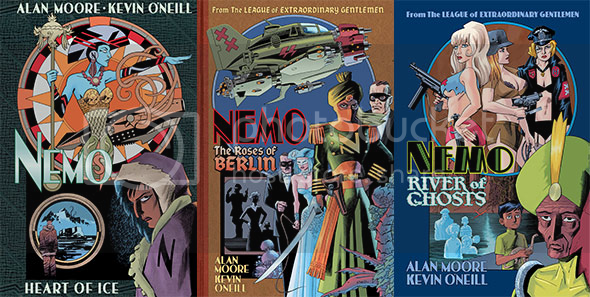 Alan Moore & Kevin O’Neill Voyage into the Unknown in NEMO: RIVER OF GHOSTS! Comics for the Public Library!Celebrate Captain America’s 75th With A Year Of Jim Steranko Variants!